Reading and share top 60 famous quotes and sayings about Parachute by famous authors and people. Browse top 60 famous quotes and sayings about Parachute by most favorite authors. 1. "The secret shape of this book is a parachuteall the lines leading to the person hanging theredrifting on the wind and always fallingwaiting for the mists to clear"
2. 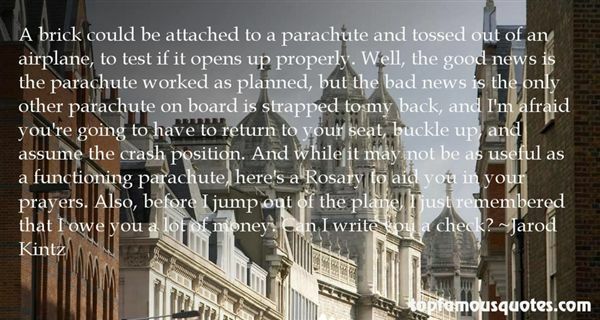 "Do not argue with a spuse who is packing your parachute." 3. "I mean, in the last few months alone, I've been pinned in a big set of white-water rapids, been bitten by an angry snake in a jungle, had a close escapewith a big mountain rockfall, narrowly avoided being eaten by a huge croc in the Australian swamps, and had to cut away from my main parachute and come down on my reserve, some five thousand feet above the Arctic plateau.When did all this craziness become my world?It's as if - almost accidentally - this madness had become my life. And don't get me wrong - I love it all.The game, though, now, is to hang on to that life. Every day is the most wonderful of blessings, and a gift that I never, ever take for granted.Oh, and as for the scars, broken bones, aching limbs and sore back?I consider them just gentle reminders that life is precious - and that maybe, just maybe, I am more fragile than I dare to admit." 4. "Just because nobody complains doesn't mean all parachutes are perfect." 5. "I've decided that if I had my life to live over again, I would not only climb more mountains, swim more rivers, and watch more sunsets; I wouldn't only jettison my hot water bottle, raincoat, umbrella, parachute, and raft; I would not only go barefoot earlier in the spring and stay out later in the fall; but I would devote not one more minute to monitoring my spiritual growth. No, not one." 6. "We regard God as an airman regards his parachute; it's there for emergencies but he hopes he'll never have to use it." 7. "I was always very active as a kid. I would climb on roofs and jump off using my parents' bed sheet, hoping it would open like a parachute. I was always getting hurt, breaking a leg, you know, bruising, cracking my head open." 8. "Charlie had Sophie strapped to his chest like a terrorist baby bomb when he came down the back steps. She had just gotten to the point where she could hold up her head, so he had strapped her in face-out so she could look around. The way her arms and legs waved around as Charlie walked, she looked as if she was skydiving and using a skinny nerd as a parachute." 9. "You said parachute. You think we're going to parachute out of here?""Yep. ""I don't think so. ""Ah, come on. Tigers aren't afraid of heights, are they? ""This isn't about heights. This is about being extremely high up in a tree and hurtling out bodies into oblivion based on a strange fabric that you now claim is a parachute." 10. "A matter, as the famous book intoned, of finding the shade of the parachute that best complemented you. But really: With no parachute at all you'd hit the pavement so hard it probably wouldn't even hurt, and you'd unleash a whole new color palate-bone, blood, muscle-in the process." 11. "I offer something very different from the lifelong career politicians who have worked their way up to run for higher office or those who can parachute in with checks for $5 million or $10 million, and that seems to be the definition of credible or legitimate. I'm rejecting that premise." 12. "I had been in France less than 48 hours before that obliging agent of yours had to stop me being run over by a French van full of French chickens because I'd looked the wrong way before crossing the street. Which shows how cunning the Gestapo are. "This person I've pulled from beneath the wheels of certain death was expecting traffic to travel on the left side of the road. Therefore she must be British, and is likely to have parachuted into Nazi-occupied France out of an Allied plane. I shall now arrest her as a spy." 13. "I certainly remember building model rockets. It was fun to watch the rocket blast into the air, suspenseful to wonder if the parachute would open to bring the rocket safely back." 14. "When a person has swum, traveled, run a lathe, planted flowers, ridden a motorcycle, made wine, painted a picture, parachuted, he has increased the fund from which he may draw for new figural developments. In other words, as the background of his experience becomes more diversified, it also becomes potentially more harmonious with a whole range of happenings." 15. "A mind is like a parachute. It doesn't work if it is not open." 16. "Both optimists and pessimists contribute to society. The optimist invents the aeroplane, the pessimist the parachute." 17. "Often, M.B.A.s will parachute around from one company or industry to another, without really understanding what's behind it." 18. "Sure you can manage that broom, Potter?" said a cold, drawling voice.Draco Malfoy had arrived for a closer look, Crabbe and Goyle right behind him. "Yeah, reckon so," said Harry casually. "Got plenty of special features, hasn't it?" said Malfoy, eyes glittering maliciously. "Shame it doesn't come with a parachute - in case you get too near a Dementor. "Crabbe and Goyle sniggered. "Pity you can't attach an extra arm to yours, Malfoy," said Harry. "Then it could catch the Snitch for you." 19. "When the person with a chokehold on your soul says, "Jump," you pack your parachute and hope for a soft landing." 20. "Love is like jumping out of an airplane with no parachute. But there's no need to be frightened, because that plane is still on the ground." 21. "A brick could be attached to a parachute and tossed out of an airplane, to test if it opens up properly. Well, the good news is the parachute worked as planned, but the bad news is the only other parachute on board is strapped to my back, and I'm afraid you're going to have to return to your seat, buckle up, and assume the crash position. And while it may not be as useful as a functioning parachute, here's a Rosary to aid you in your prayers. Also, before I jump out of the plane, I just remembered that I owe you a lot of money. Can I write you a check?" 22. "Take our own company as an example: We're living proof, we jump with our own parachutes." 23. "Bigots are actually funny to me in the way that people who still wear parachute pants give me a chuckle." 24. "Who are you today? Are you a gulfstream, uplifting others... or are you a bad parachute?" 25. "That's like leaping off a precipice and trying to knit yourself a parachute on the way down." 26. "The scenes in the show were filmed with a crew of really excellent stunt jumpers, but we had the feel of the parachutes, so we could be more realistic in the roles." 27. "He thinks of the rotten parachute they played with as kids in Arcadia: they hurtle through life aging unimaginably fast, but each grasps a silken edge of memory that billows between them and softens the long fall." 28. "Coming down under a parachute is quite different as well. You hit the ground pretty hard, but all the systems work very well to keep it from hurting, so it doesn't even hurt when you hit. It was a great experience to be able to do both." 29. "The sky in Seattle is so low, it felt like God had lowered a silk parachute over us." 30. "On our last mission - our "final exam" - we were airlifted to a remote region, and we parachuted directly into a hostile enclave. We had to subdue the enemy using hand-to-hand tactics like tae kwon do and pugil sticks, cut their hair in styles appropriate to their particular face shapes, and give them perms." 31. "When you jump onto the emptiness of the loneliness, the best parachute to land you safely will be the books!" 32. 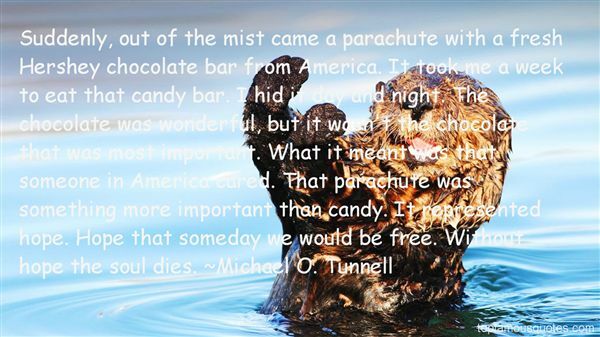 "Suddenly, out of the mist came a parachute with a fresh Hershey chocolate bar from America. It took me a week to eat that candy bar. I hid it day and night. The chocolate was wonderful, but it wasn't the chocolate that was most important. What it meant was that someone in America cared. That parachute was something more important than candy. It represented hope. Hope that someday we would be free. Without hope the soul dies." 33. "Beth's fingers trembled in his hair, and her forehead dropped against his. A heavy, wet tear fell onto Lincoln's lips, and he licked it. He pulled her close, as close as he could. Like he didn't care for the moment whether she could breathe. Like there were two of them and only one parachute." 34. "I got quite bored when I was hanging in the air. I want to do it without a parachute next." 35. "I am classified as a disabled veteran. The reason I'm disabled is because I have wounds and injuries that I got while on active duty... from parachute jumping to combat to gunshot wounds, all that stuff." 36. "In an essay titled A View From the Front Line, Jencks described her experience with cancer as like being woken up midflight on a jumbo jet and then thrown out with a parachute into a foreign landscape without a map:"There you are, the future patient, quietly progressing with other passengers toward a distant destination when, astonishingly (Why me?) a large hole opens in the floor next to you. People in white coats appear, help you into a parachute and — no time to think — out you go. "You descend. You hit the ground....But where is the enemy? What is the enemy? What is it up to?...No road. No compass. No map. No training. Is there something you should know and don't? "The white coats are far, far away, strapping others into their parachutes. Occasionally they wave but, even if you ask them, they don't know the answers. They are up there in the Jumbo, involved with parachutes, not map-making." 37. "Stephen Burt is Professor of English at Harvard. "Butterfly with Parachute"Stephen BurtA real one wouldn't need one,but the one Nathan draws surely does:four oblongs the size and color of popsicles,green apple, toasted coconut and grape,flanked, two per side, by billowing valentine hearts,in a frame of Scotch tape.Alive, it could stay off the floorfor a few unaerodynamic minutes;thrown as a paper airplane, for a few more.Very sensibly, therefore,our son gave it something, not to keep it apartfrom the ground forever, but rather to make safe its descent.When we ask that imagination discover the limitsof the realworld only slowly,maybe this is what we meant." 38. "My mockingjay pin now lives with Cinna's outfit, but there's the gold locket and the silver parachute with the spile and Peeta's pearl. I knot the pearl into the corner of the parachute, bury it deep in the recesses of the bag, as if it's Peeta's life and no one can take it away as long as I guard it." 39. "I no longer feel allegiance to these monsters called human beings, despise being one myself. I think that Peeta was onto something about us destroying one another and letting some decent species take over. Because something is significantly wrong with a creature that sacrifices its children's lives to settle its differences. You can spin it any way you like. Snow thought the Hunger Games were an efficient means of control. Coin thought the parachutes would expedite the war. But in the end, who does it benefit? No one. The truth is, it benefits no one to live in a world where these things happen." 40. "It's as if I'm Finnick, watching images of my life flash by. The mast of a boat, a silver parachute, Mags laughing, a pink sky, Beetee's trident, Annie in her wedding dress, waves breaking over rocks. Then its over." 41. "Next to me N floats in a parachute of his own design: He wants the divorce; I don´t. He pushed me; I fell. I plummet; he pulls the ripcoard and feels a refreshing lack of weight or gravity." 42. "I always wonder about raindrops.I wonder about how they're always falling down, tripping over their own feet, breaking their legs and forgetting their parachutes as they tumble right out of the sky toward an uncertain end. It's like someone is emptying their pockets over the earth and doesn't seem to care where the contents fall, doesn't seem to care that the raindrops burst when they hit the ground, that they shatter when they fall to the floor, that people curse the days the drops dare to tap on their doors.I am a raindrop.My parents emptied their pockets of me and left me to evaporate on a concrete slab." 43. "My words wear no parachutes as they fall out of my mouth"
44. "Minds are like parachutes - they only function when open." 45. "Your mind is just like parachute ! if you don't open it, it won't work !" 46. "Water- the ace of elements. Water dives from the clouds without parachute, wings or safety net. Water runs over the steepest precipice and blinks not a lash. Water is buried and rises again; water walks on fire and fire gets the blisters." 47. "One rose leaf, falling from an enormous height, like a little parachute dropped from an invisible balloon, turns, flutters waveringly." 48. "I have woven a parachute out of everything broken." 49. 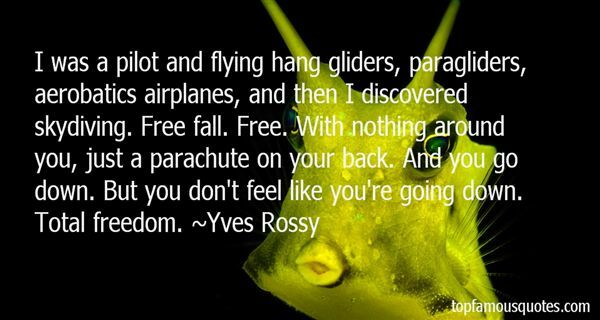 "I was a pilot and flying hang gliders, paragliders, aerobatics airplanes, and then I discovered skydiving. Free fall. Free. With nothing around you, just a parachute on your back. And you go down. But you don't feel like you're going down. Total freedom." 50. "I did not just fall in love. I made a parachute jump." Xenophobia manifests itself especially against civilizations and cultures that are weak because they lack economic resources, means of subsistence or land. So nomadic people are the first targets of this kind of aggression."